Republic of Congo and Democratic Republic of Congo. Collected from various biotopes throughout the Lower and Central Congo basin. 8″ (20cm). Usually a little smaller in aquaria. A failry active species requiring a tank of at least 48″ x 12″ x 12″ (120cm x 30cm x 30cm) – 110 litres in size. Not a good choice for the planted tank, as it will munch most greenery. Furnish the tank with smooth rocks and driftwood branches instead. Sand or gravel can be used as substrate. If you want to try some plants, use species such as Anubias or Bolbitis, as most fish leave these alone. A little water flow is appreciated. Omnivorous and will accept most foods offered. It should be fed a decent proportion of vegetable matter to keep it in the best of health. A diet of small live and frozen foods such as bloodworm and Daphnia, along with frozen peas (remove the shells), Spirulina flake and blanched spinach would provide the desired balance. 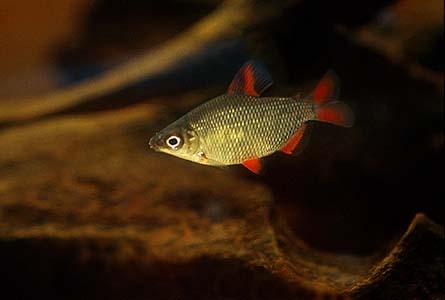 Not an aggressive fish, but its potential size should be considered when selecting tankmates for it. 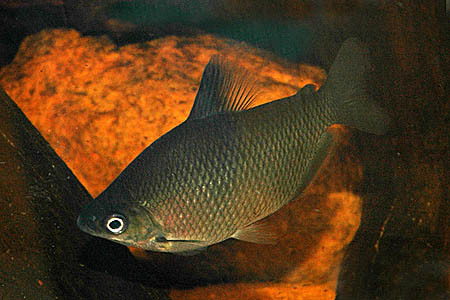 It makes an ideal resident of an African community alongside species such as Congo tetras, Synodontis catfish and smaller Polypterus or Mormyrids. Alternatively, it can be combined with larger South American characins, medium-sized catfish and peaceful cichlids. It may nip a little at slow-moving or long-finned tankmates, so keep a close eye on any new introductions. Unlike some other members of the genus, it can be maintained in a group. Not recorded in captivity, though is known to spawn in large shoals in open water in nature. Apparently, it’s now being produced commercially for the trade in eastern Europe. This species has become more common in the trade in recent years, and makes an interesting addition to larger communities. It develops bright red fins as it matures. Some specimens develop a pink sheen on the underside. These variations may indicate different species, as there are several in the genus that superficially resemble D. affinis.